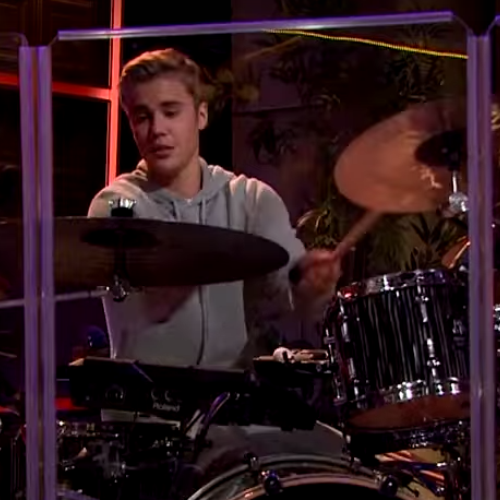 Keen-eyed fans spotted Biebs on the drum kit for the closing of The Late Late Show this week. We always knew Justin Bieber was cool as a cucumber, but we didn't know he was THIS cool. At the close of The Late Late Show with James Corden this week, keen-eyed fans realised that the house band's drummer had been replaced with none other than Biebs himself! Justin Bieber Opens Up On Working With Diplo And Skrillex! Yep, despite being unannounced throughout the show, Bieber was rocking out on a drum kit, showing off his musical skills, with the only acknowledgement being a cheeky bow at the end of the show. Hit play on the video above to see Justin's skills in action, this boy can SERIOUSLY lay down a beat.